Registration for a Spring 2019 beginning beekeeper course will be open soon. WSU Snohomish County Extension is sponsoring a session of the apprentice level course in the Washington State Beekeepers Association’s Master Beekeeper Program. 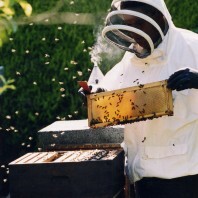 The five-week course serves as a thorough introduction to beekeeping for novice beekeepers as well as a comprehensive refresher course for experienced apiculturists. The fall 2018 session of the Master Beekeeper Apprentice Level Course will be Monday evenings from 6:30 p.m. to 9:30 p.m. starting November 5, 2018 at the WSU Snohomish County Extension Cougar Auditorium in McCollum Park, 600 – 128th St SE, Everett. Fall 2018 registration is now open! Class size is limited and always sells out well in advance of the course. Cost for the five-week series is $100 per person. More information on the course and instructor.